Heavy rains continued to lash Bengaluru and surrounding districts in Karnataka, inundating several localities and disrupting normal life, authorities said on Thursday. Over the last 24 hours, the city received rainfall of up to 6.6 cm, which flooded several arterial roads in the city disrupting vehicular movement, the Karnataka State Natural Disaster Monitoring Centre (KSNDMC) said. 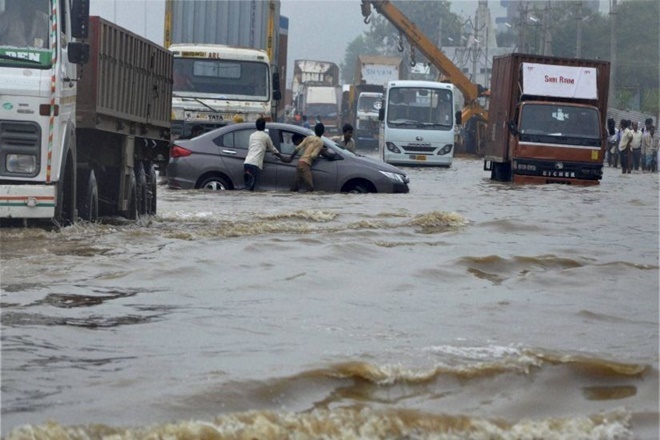 Heavy rains on Wednesday night flooded several city roads, in certain areas up to two feet, leading to massive traffic jams. The southern suburbs of the city have been receiving intense rainfall since Sunday. Chief Minister H.D. Kumaraswamy has directed the civic authority officials to be on high alert to avert any mishaps. “Rain and winds could get stronger in the next two days. So people residing in the low-lying areas should be cautious,” a statement from Kumaraswamy’s office said. Civic officials have been pumping out water from homes and clogged storm water drains. “We have been receiving distress calls from people complaining about rain water entering homes,” an official from the civic body Helpline said. Rains have also been lashing south interior districts of Mandya, Kodagu, Tumakuru and Ramanagara and the northern districts of Vijayapura, Raichur, Koppal and Yadgir. Moderate to heavy rains are likely to continue over the next two days in Bengaluru and surrounding districts, according to the India Meteorological Department.